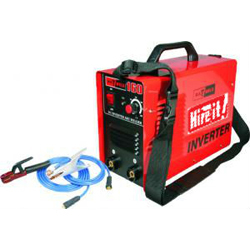 The 160A/200A Welder Inverter is ideal for the DIY enthusiast around home and the workshop for repair work and light steel fabrication work. This welder can also be used as a DC TIG welder by attaching an external TIG torch and argon gas bottle with flow meter. It will weld stainless steels, alloy steels, carbon steels, copper and other metals. It can weld electrodes of different specifications, including basic and aluminium electrodes. This compact and lightweight machine is ideal for transporting due to its carry handle and convenient shoulder strap. Comes standard with over voltage and over current protection. The Inverter is fitted with an overload protection switch that is activated once the components reach overheating levels or the duty cycle is exceeded. Supplied with cables & welding shield.